Your creative drive and expressive ideas are your best allies now, personally and professionally. Balancing your priorities may not be easy. Take care of responsibilities first. It’s easy to overdo it, since you may become so involved in meeting your challenges that you forget about your physical limitations. Even though you may not like to admit to them, you’ll do yourself a favor by maintaining an awareness of your body’s capabilities. There are plenty of ups and downs in your love life. Your fantasies are in overdrive from June 4 to 14, and if you’re looking for sweet romance, a fascinating love interest emerges during the Moon on June 13. 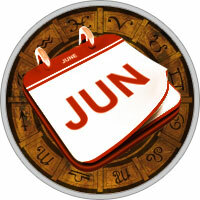 Reality raises its head from June 15 to 19, so at least you’ll find out where you stand. But watch out, because there’s another option on the horizon after June 20, and it could just be someone who didn’t work out before. Do you really want to try it again? Speculative ventures garner your attention, and reasonable success is possible if you can afford the risks. But avoid anything that seems unstable or deals that have holes, because you could fall right through them from June 9 to 24 if you’re jumping in before you think! Consider all options in the light of how they will affect your stability, and listen to your deeper security needs during the Moon on June 28. Spiritual and creative energies offer a beneficial retreat from June 7 to 16. This is a time to go inside and listen to your inner voice.